I grew up seeing many 90s horror films in video stores when I was a youngster. Rumpelstiltskin, Night of the Demons 3 and many of the Leprechaun movies manifested their cover arts into my little mind. The latter of the three were some of the most memorable. Even at such an age, I never thought of these Irish terrors as horrifying. 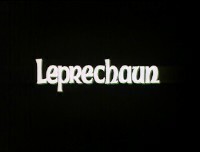 They looked cheap and comical, so when I finally watched the first Leprechaun, I wasn’t surprised by what I saw. In fact, the story and setting turned out to be eerily close to what I had always imagined it might be. Rarely had I ever guessed and succeeded in my predictions to what route a horror film would take from purely cover art based perceptions. All I had to go by was a short green monster peaking through a doorway. Cheesy but fun; that’s all I expected. But is Leprechaun actually good? Daniel O’Grady (Shay Duffin) returns to his wife (Pamela Mant) in the United States after stealing one hundred gold coins from an Irish leprechaun (Warwick Davis). When the leprechaun follows O’Grady to the US to retrieve his coins and kill his wife, Daniel traps the fiend with the magic of a four-leaved clover in his basement. Ten years later, the abandoned O’Grady house is purchased by J.D. Reding (John Sanderford) as a present for his daughter, Tory (the famous Jennifer Aniston of TV’s Friends). Painters Nathan (Ken Olandt of April Fool's Day), Ozzie (Mark Holton) and Alex (Robert Gorman) try to shape up the cobwebbed home, but when Ozzie cracks open a crate in the basement, the evil green creature is unleashed once again. Ozzie sees the leprechaun clear as day, but nobody believes him because he has the mind of a child; mentally slow. The youngest painter, Alex, whose only a kid, goes on an adventure with Ozzie, where the two find a whole bag of gold coins. Never mess with a leprechaun’s gold, or it’ll be the death of you. Give it back, before he takes it from ya wee one! I couldn’t believe that Jennifer Aniston actually starred in this low budget oddball. I always heard about it, but it took a full viewing to come to grip with its reality. Her character, Tory, whose basically the main protagonist of the feature, first comes off as a bit of a brat. Her father has given her a new home, and as rundown as it is, she’s not at all grateful. Her acting is also a major weak part of the original. It has been said multiple times that Leprechaun was the film that Aniston starred in before she took acting lessons. However, the talent is often measured much lower than it deserves, and while she doesn’t appear to give anything award worthy, it’s watchable. Anyone who knows about Jennifer probably agrees with me that her characters share the same traits. She plays the same person every time, which is not necessarily bad. At least she’s good at what she does. But if you’re used to her routine performances, it’ll be a breath of fresh air when Tory comes on screen. It’s not too far a stretch, and yes, she’s quite bad at it, but it’s something new and that’s gutsy. The leprechaun is a lot like the Freddy Krueger villain in the A Nightmare on Elm Street entries from the late eighties to early nineties. He cracks jokes and is not creepy in the least bit, although I applaud the make-up effects on Warwick Davis. It’s a popcorn movie, and meant to get a little chuckle out of the audience. I mean, the overall story is ridiculous to begin with: a leprechaun kills people just because he wants his coins back. He’s not a one-dimensional monster, but he sure kills mindlessly. People who don’t even have his treasure die by his petite hands. Every scene he’s in is entertaining to watch just to see what he says or does. Crotch grabbing, speeding on the road with a toy car, and rhyming while offing shopkeepers. It’s a blast! Only the leprechaun would ever think of using his buckle as a razor, and what must certainly go down in movie history as a first time is when Warwick kills a man by jumping on him with a pogo stick. What creativity! The cast inevitably finds out that Ozzie was right and that a leprechaun is indeed real. They try to return to gold to him but one’s missing. Can you remember where it is? I’m not sure why four-leaved clovers should stop a magically mini-man, but that’s the mythology here and I can’t say that I didn’t enjoy it. Warwick’s shenanigans are just what this movie is about. Who cares about character development? Well, it’s there for anyone who wants it, but in Leprechaun, the motive is to give a full room of people something to be grossed out by and still have as good a time as one would with a comedy. It’s bloody, it’s silly, it’s not of this world. But it’s also really mediocre. How something this okay spawned almost half a dozen sequels is amazing. Lionsgate released this film on DVD with a beautiful full screen transfer with trailers for the film and its first sequel. 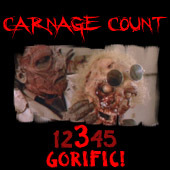 The audio is pure, and there’s nothing that should stop you from seeing this cult classic. Watch and learn before your luck runs out. Rent it!